Detailed look at one of the prototype top services on the WTA Tour. The recent semifinals showing at the 2017 Australian Open was an incredible success for the 34 years old Mirjana Lucic-Baroni (*82 / CRO), who made it so far in a Grand Slam tournament after long 18 years!! The former 1999 Wimbledon semifinalist first appeared as a pro player at the Grand Slams during the 1997 US.Open at the age of 15 years. Before, she captured the junior titles at the 1996 US.Open and 1997 Australian Open. With her junior US.Open crown at the age of 14 years she belongs to a very exclusive club of players who have been able to accomplish the same – besides her also Jennifer Capriati (USA), Martina Hingis (SUI) and just this past week in Melbourne Marta Kostyuk (UKR). Unfortunately, big pressure from her father led Mirjana’s life and career into a turmoil and instead of becoming the “next big thing”, she felt out of top 100 during 2000 and has stumbled in the lower levels of professional tennis until finding the needed stability on the side of her today’s husband Daniele Baroni. Mirjana came back into WTA top 100 in 2014 and her recent results in Melbourne put her for the first time in her career into top 30!!! Already in the late 90’s, Mirjana belonged to the most dominant serving players on the WTA Tour as she was one of the first of them who really got to understand the efficient use of the pronation, an aspect, which many male and female pros still struggle with today. On the photos from 1998 shown below is well visible how fast she was able to pronate with the integration of the body energy already in the age of 16 years. 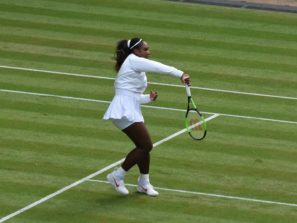 Based on my subjective view, I would see her 1st service even slightly more dominant back then than now as her right hip seemed to move better into the court with the stroke (needless to say, she was also carrying more weight back then = more body momentum was possible). Studying Mirjana’s service was for me an extremely important input in developing an optimal model of the female service and she clearly qualifies for the Service 3.0.